The gray M3 Tri-Element Hanging Ceiling Microphone with 6' Cable from Audix is an audio capture solution designed for applications where aesthetics, sound quality, and ease of installation are critical. It can be used for video conferencing, distance learning, courtroom activities, surgical procedures, ambient room miking, and surveillance. The M3 incorporates three phase-coherent hypercardioid capsules with tailored frequency responses optimized for speech intelligibility. It minimizes frequencies caused by noise, vibration, paper shuffling, fans, and air conditioning. 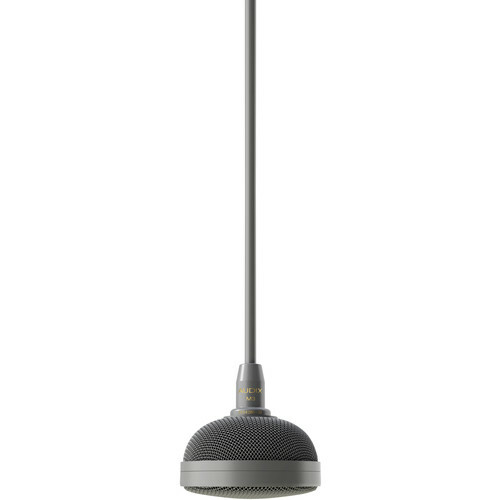 A shielded, silicone-jacket microphone cable ensures a balanced signal and a very clean look. Furthermore, the electronics above the ceiling are housed in a plenum-rated junction box and cable connections are made via an RJ45 connector. Installation requires drilling a single 5/8" hole in the ceiling. Finally, the M3 mounting hardware adjusts the cable hanging height up to four feet from the ceiling surface without removing ceiling tiles.